Last weekend I participated in the 21st Ludumdare 48 hour game making competition. It was a lot of fun. Mahlena came over to keep me company, and I programmed almost all weekend. I used the OHRRPGCE, and talked the OHR community into timing our own annual 48 hour contest to be simultaneous with the Ludumdare competition, so that people could double-enter. Several did. I also have a page for it at SlimeSalad, and the Ludumdare page for it is here. 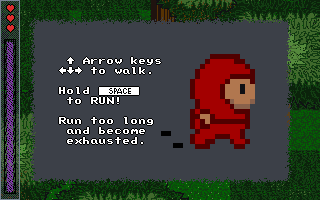 Basically, you run away from the wolf, and try to find the cabin. I hacked together some pretty decent-seeming ai for the wolf, and took care to avoid overusing randomness. The map is generated randomly, but the gameplay is pretty deterministic. 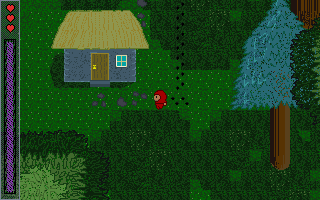 Procedurally generating the forest was pretty fun, and not as hard as I feared it might be. 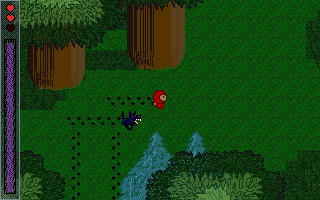 I allocated layers 2-7 as overhead, then I generated trees from the top of the map down to the bottom, dynamically placing the tiles in the lowest free layer. That means that seven trees would have to overlap before there would not be room for the tiles (possible, but very rare). Trees layered badly when they wrapped over the top of the map and onto the bottom of the map, but it was too minor for me to care about in such a time-crunch. In retrospect I really should have added some landmarks scattered around the forest. I did have one landmark, a cobblestone path that lead from the cabin to a well. It made a big difference in finding the cabin, since the cabin was only 3×3 tiles, and the footpath could stretch over as much as half the map. Still, it is a big map, and more landmarks would have helped. I am also very happy for Mahlena’s brief playtesting. The wolf chomped her rapidly and repeatedly, and that convinced me that the game mode I had been working on should become “Hard Mode”, and that I should add Normal and Easy modes. So far the ludumdare responses have been mostly positive, and all the OHRRPGCE users who have played it seemed to like it. I will update this post after the voting period is over. The voting has completed, and out of 509 contestants, I scored in 12th place for Audio (which really surprises me, because I was just doodling and warbling into the microphone) and I scored in 17th place for Humor, which I am proud of, because so very many of the contestants tried to make funny games. This entry was posted on Thursday, August 25th, 2011 at 11:35 am	and is filed under games, ohrrpgce, Uncategorized. You can follow any responses to this entry through the RSS 2.0 feed. You can leave a response, or trackback from your own site.